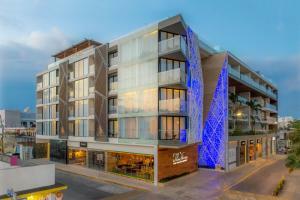 The Fives Downtown Hotel & Residences Playa del Carmen, Curio Collection, is a stunning hotel offering the best of city and sea. Rooms are decorated with contemporary Mexican flair, offering comforts such 50-inch HDTVs and kitchenettes. Suites feature full kitchens, spacious bedrooms, living and dining areas, gorgeous city views, and the option of a plunge pool or a terrace garden. Mercatto Restaurant delights with show cooking and traditional Italian dishes modernized and served sharing-style. Don't miss Purobeach, a rooftop area offering an infinity pool, cabanas and sun loungers, spa services, great music and beautiful sea views. Located in Playa del Carmen, approximately 35 miles from Cancun International Airport. The beach is just a short two-block walk away.